Has probably the best Disney villain, at least in the classic Disney library and that goes a long way in making up for the deficiencies of this film. As an impressionable youth I learned from this movie that fur coats should be frowned upon, but I also picked up smoking slim cigarettes with a long holder so I think it's a bit of a wash.
Anita: "How are you?" Cruella De Vil: "Miserable, darling, as usual, perfectly wretched." 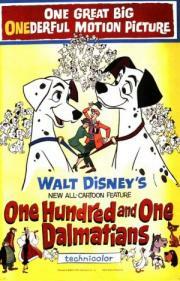 One of the better classic Disney films. Not too many songs and they feel integral to the story. Visually it's good stuff with the snowy settings and the gothic castle. Surprisingly grim and scary; I bet Cruella deVil has caused a lot of nightmares.